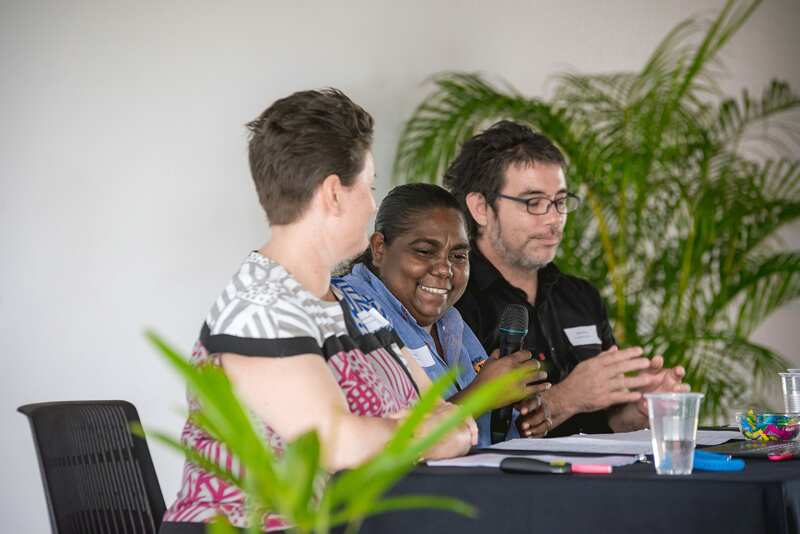 Last week, over 50 people from across the country joined ANROWS for our “Assessing Risk and Promoting Safety: Using the National Risk Assessment Principles (NRAP)” forum in Darwin. Participants heard from a range of experts about domestic and family violence (DFV) risk assessment. Bernadette Wombo, Coordinator of the Gunbalanya Women’s Safe House, joined us from Gunbalanya in the West Arnhem region. She discussed how she used the NRAP, combined with local knowledge, to inform the development of safety planning practices for the safe house. 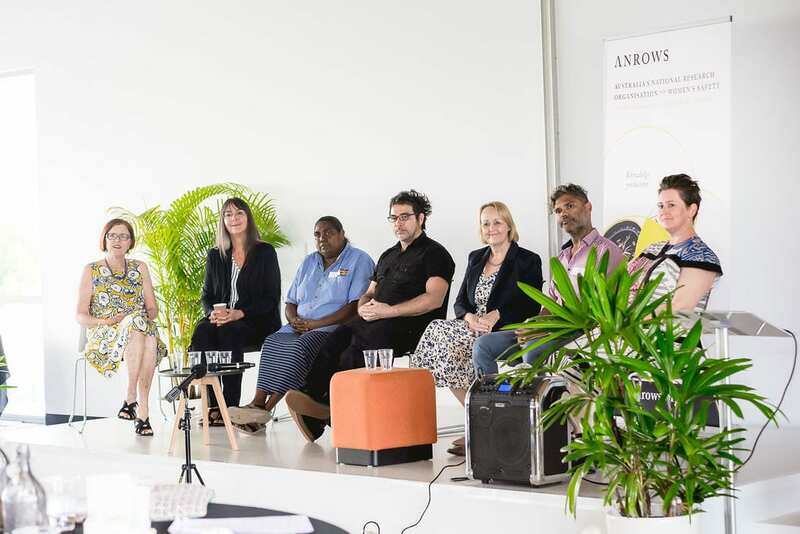 Bernadette was joined by Adrian McCann from the West Arnhem Regional Council and Sam Bowden, then an NGO project freelancer and member of the ANROWS Practitioner Engagement Group, who worked alongside her on the project. Associate Professor Kathleen Baird from Griffith University discussed the ongoing implementation of an integrated approach to risk assessment and management in Queensland. Professor Myrna Dawson from the University of Guelph in Ontario, Canada, discussed the role of DFV death review panels in helping us to strengthen approaches to risk assessment and management. “Death reviews can provide an aggregate understanding of risk, but often preclude an in-depth case-based analysis,” Professor Dawson said, during her presentation. Presentation slides from the forum are available on the ANROWS website. A video of the day will be made available soon. ANROWS is pleased to announce a new research project, led by Dr Angela Nicholas from the University of Melbourne, that will result in the development of a best practice evaluation guide for male perpetrator programs in Australia. Following on from the ANROWS-funded project Evaluation readiness, program quality and outcomes in Men’s Behaviour Change Programs, this research will update existing knowledge on evaluating complex interventions. be aware of the complexities of designing a comprehensive evaluation of perpetrator program within given constraints. Find out more about this new project. Fitz-Gibbon, D., McCulloch, J., & Maher, J.M. (2019). NSW Government Sentencing Council: Review of sentencing for murder and manslaughter. Clayton, VIC: Monash Gender and Family Violence Prevention Centre. Frohmader, C. (Compiler). (2019). Violence, abuse, exploitation and neglect against people with disability in Australia: Available data as at March 2019. Strawberry Hills, NSW: Disabled People’s Organisations Australia. Smart, J. (2019). Needs assessment: Families and children expert panel practice resource. Southbank, VIC: Australian Institute of Family Studies. Thomas, K., Segrave, M., & InTouch Multicultural Centre Against Family Violence. (2018). Forced marriage in Australia (Research brief). Clayton, VIC: Monash Gender and Family Violence Prevention Centre. Thomas, K., Segrave, M., & InTouch Multicultural Centre Against Family Violence. (2018). Support options for migrant women on temporary visas experiencing family violence in Australia (Research brief). Clayton, VIC: Monash Gender and Family Violence Prevention Centre.